gooooooood idea!!! Nive, simply, estethic.. good job! keep on producin such masterpieces! 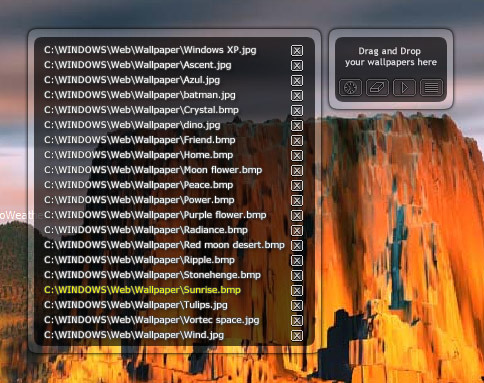 Good idea,but how can I save that wallpapers in widget?If I drop wallpapers in and after that restart computer,so after that there are not any wallpapers in!It doesn`t save pics,what have I to do??? Sorry, I didn't realize that widgets don't save the settings the same way as regular DX objects do. I'll have to work on this to save the settings manually in a text file or in the registry. It still works as long as you don't close the object, but for now the settings are reset once you exit and rerun the widget. Very nice, although an "autofit" function for the WP's is absolutely necessary: now they get stretched out. This is great, paxx. I use it all the time. How did I ever do without this for so long? I have tried this on three pc's and it will only work on one of them? I can add pic to the list no problem if i click next pic nothing happens but if I go to desktop settings the pic is there? but it's not the pic on my desktop. very strange. A'm I missing something? nice work!but i only have one problem though, after i run this widget and dragged all the wallpapers, it runs fine but then when i check my folder containing the wallpapers it duplicates itself!! anyone having the same problem? or anyone who can help me?